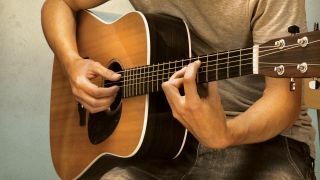 ACOUSTIC WEEK: Take your chord changes into a higher gear with our handy exercises designed to help speed up this essential technique. Tricky chord changes are frustrating for any guitarist. You just want to play a song, and maybe sing along, too, but the flow of the tune you’re playing is continually interrupted while you arrange your fingers into the right chord shapes. If this sounds all too familiar, some straightforward approaches can help you speed up those changes, and help you become more confident in that all-important, yet often overlooked area of rhythm guitar. Good, accurate chord changing is a vitally important skill to develop, and can be overlooked in favour of perhaps ‘more exciting’ things to play, especially if you’re itching to improve your soloing skills instead. However, every player should develop their rhythm chops, especially if you plan on learning some new songs. Check out the following exercises for some handy tips, from basic open chord examples to more advanced finger-twisting shapes that'll challenge any player! These open-chord ‘block changes’ are where the same shape is used on a different set of strings to make a new chord. This means you can hold the shape as you switch, without letting your fingers splay out away from the fretboard. Get started by repeating only bar 1, then introduce bar 2 as you gain confidence. Often, a handful of chords can share strings or frets in common - which means you don’t have to take all of your fingers off the strings. Obviously, recognising a finger that you can use to ‘anchor’ you in place helps speed up the change. Try to move ‘non-anchoring’ fingers together in one slick shift. The ‘barre chords’ in bar 1 don’t actually need a barre. Although you’ll need a steady first finger stretch, you can get by with only fretting the bass notes - a useful trick to employ during long passages of stamina-sapping barre chords. The chords in bar 2 do need barres, so try to form the shapes in mid-air before you touch the strings. These more advanced chord shapes are real finger-twisters! Take your time learning how to fret each chord accurately before moving on to tackle the changes. Make sure your fourth finger is bent and not stretching to reach the string. You should be fretting on your fingertips, and not on the front of your fingers. We’ve assigned four minutes in our practice plan for you to familiarise yourself with any tricky chord shapes, but you may need to spend a little longer. It’s all about muscle memory after all and if you find yourself playing a chord wrongly then repeating it will only ingrain the bad habit. By the same token, resist the urge to practise too fast too soon. It’s better to play at a manageable speed to gradually develop your accuracy and raise your speed in the longer term.